I can't believe the weekend is over already. 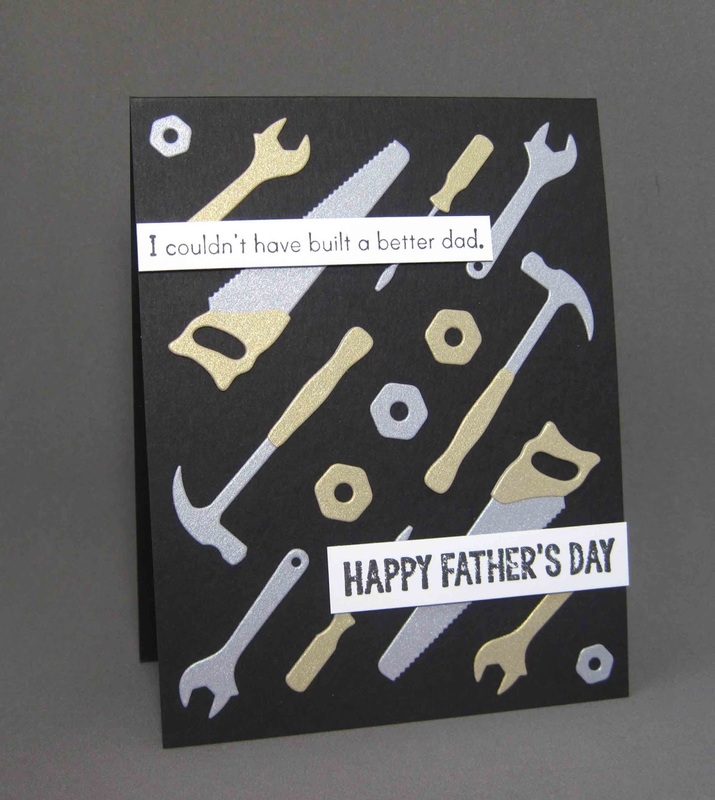 I had really hoped to get more time in the Craft Cave but at least I managed to get 2 cards done. 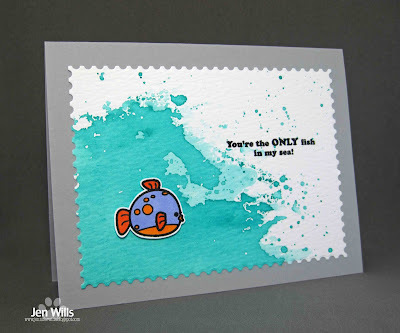 This card uses the palette from the Colour Me challenge and the design from Freshly Made Sketches. 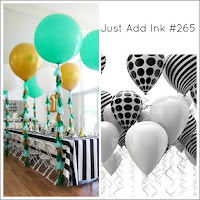 I was inspired by the decorations in the Colour Me photo and pulled out some Simon Says balloon dies and a sentiment. This came together really quickly which doesn't happen too often. :) Love that! 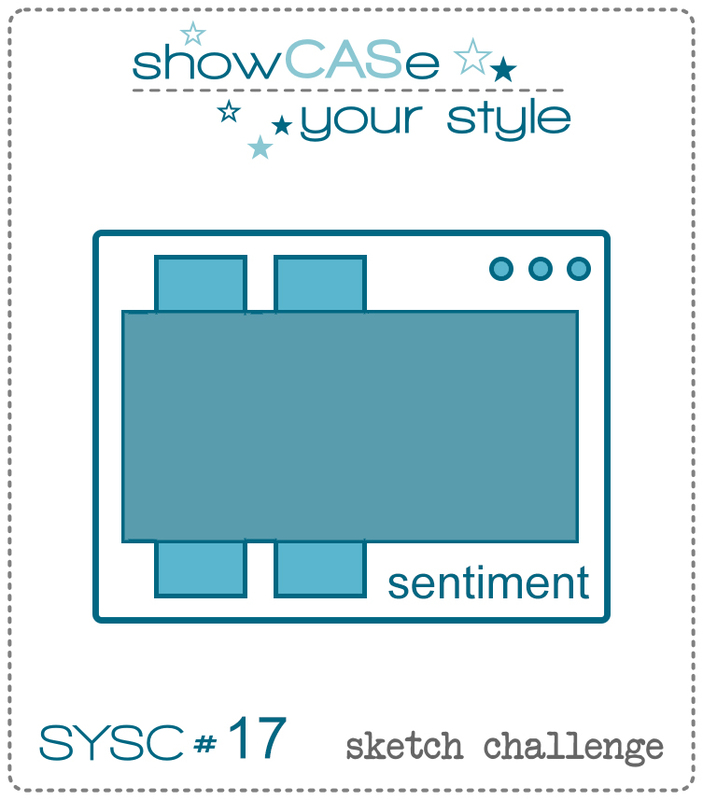 Next up is a card using the sketch from Fusion and the palette from ColourQ. 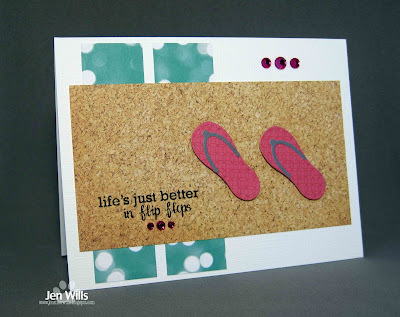 I love the adorable butterfly flip flops in the ColourQ picture but despite them and the butterfly in the Fusion photo I veered away from butterflies completely. 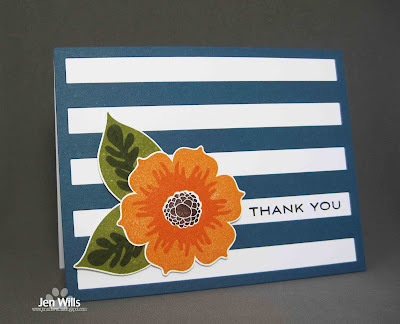 Instead I inked up this Hero Arts sun and sentiment and then added some Lawn Fawn sunshine to it. I'd like to go back and have another play with the Fusion photo but we'll see if I can get back to the Craft Cave any time soon. Hope you all have a lovely week! 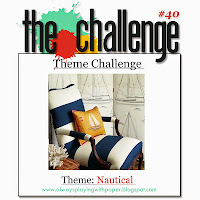 … for nautical challenges! 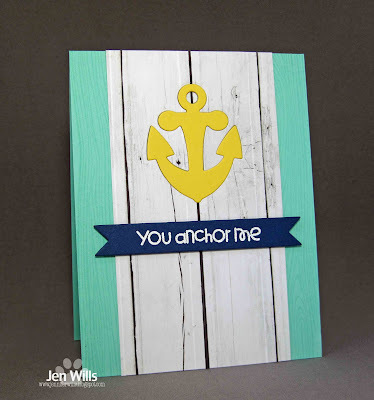 :) I've got two ocean/nautical themed cards to share today. 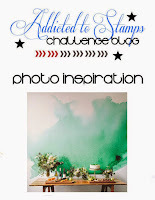 I created the first card after seeing the inspiration photo at Addicted to Stamps and More. 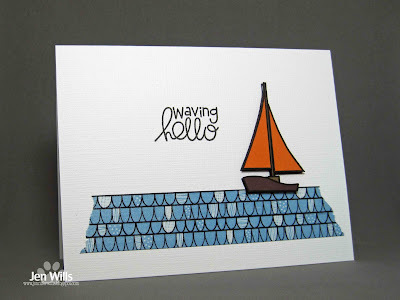 I love the watercolour wash on the wall and I decided it was finally time to try the ink "smooshing" technique that I keep seeing everywhere. 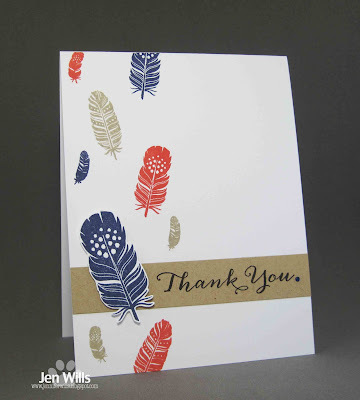 I used Peacock Feathers Distress Ink here (I LOVE that colour!) and after the "smooshing" I flicked some ink on top of it. It was pretty fun and is definitely a technique I want to play around with some more. 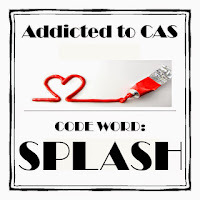 I'm also going to enter this in the Addicted to CAS Splash challenge and the Simon Says Wednesday Anything Goes challenge. 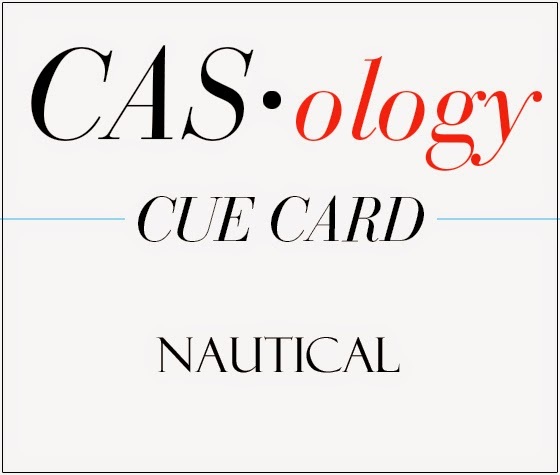 This next card is one that I made for the latest CASology challenge and decided not to use but I want to enter it over at The Challenge for their nautical theme. These stamps and the fish above are all NBUS Sweet Stamp Shop images. 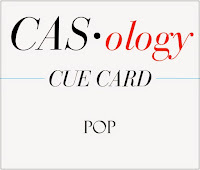 They have lots of really cute mini sets that you should check out if you haven't before. 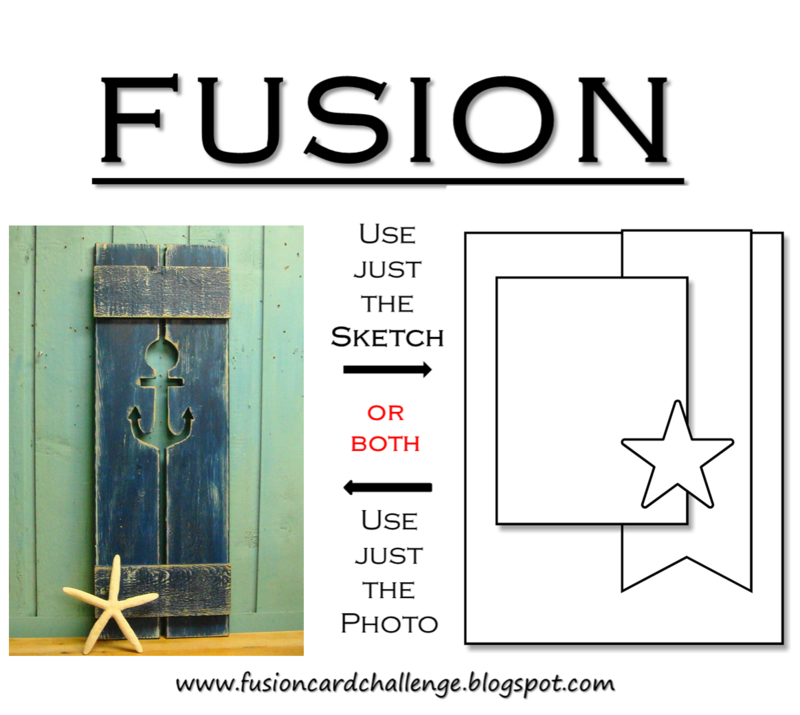 I paper pieced this one (yes, even that tiny skull and crossbones!) 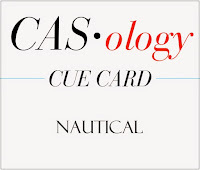 and made the banner blue to represent the sea. Time to dash back to work now. 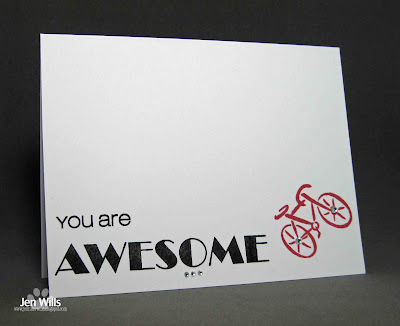 Hope you all have a fabulous weekend! 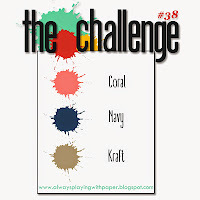 I'm pretty sure this is the first time I've ever played along with the Papertrey Ink monthly blog hop. 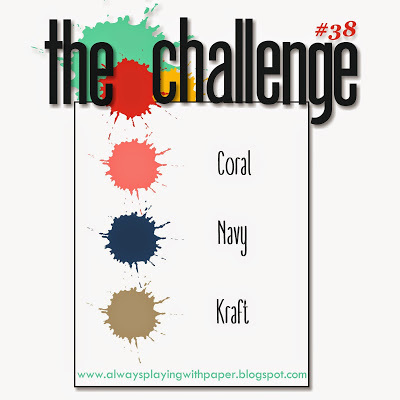 I couldn't resist the inspiration photo though so I dug into my Papertrey stash. 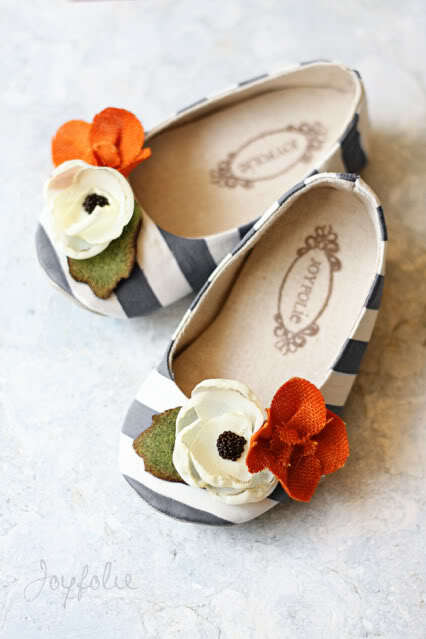 Now that I'm looking at the photo on my screen I think those stripes on the shoes are grey. I initially registered them as a dusty navy blue so that's what I went for with my stripes. The rest of it is pretty simple and self explanatory so that's it for me for now. Have a lovely day! Hi there! 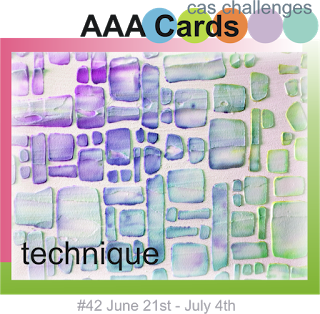 I'm popping in this evening with 2 cards for 4 challenges. 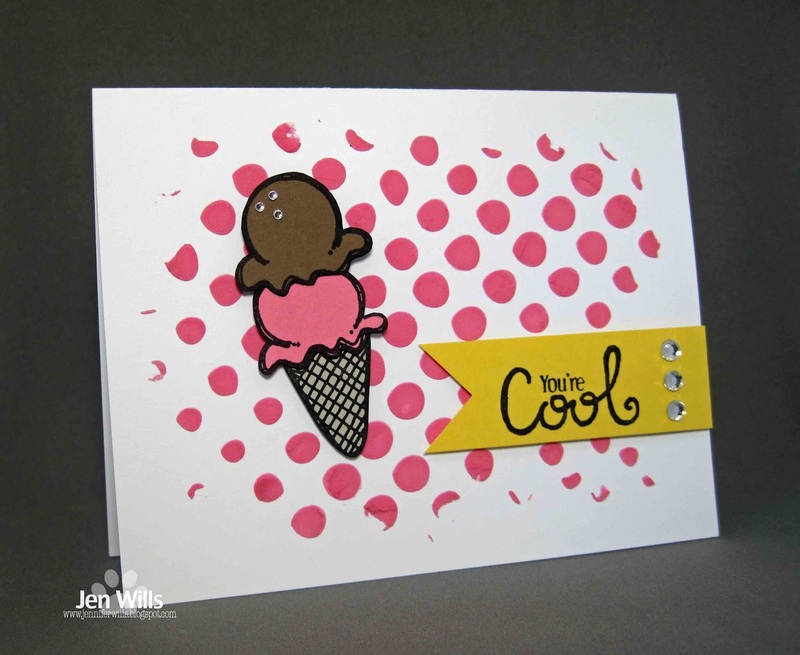 First up is this yummy ice cream cone for the CAS Summer Treats challenge at The Paper Players and the AAA Cards Paste and/or Stencil Technique challenge. 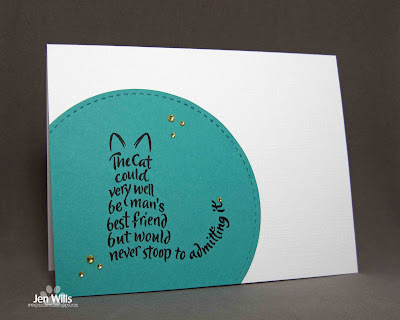 I used a Crafter's Workshop stencil and embossing paste to create the dotty background. 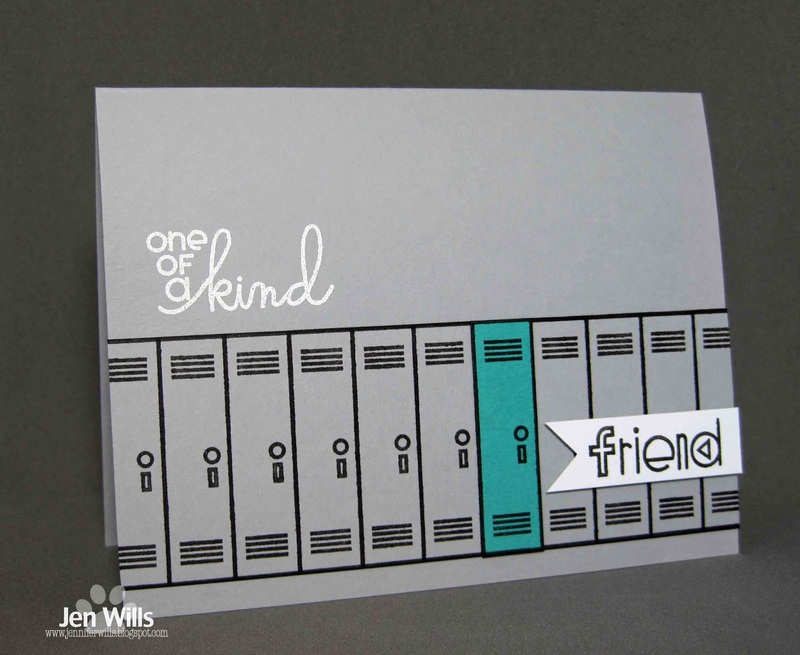 I really love the fun texture it adds to the card. 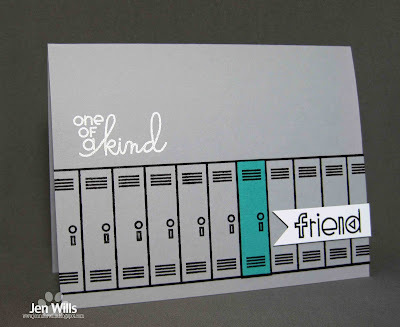 Then I paper pieced a retired Sweet Stamp Shop ice cream, added a sentiment and some gems and I was done! 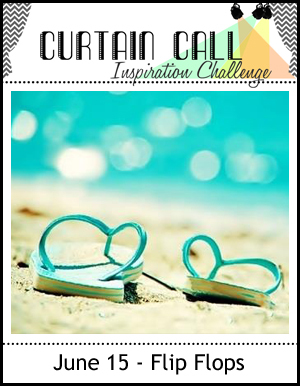 Next up is a card using the inspiration photo from Curtain Call paired with the sketch from ShowCASe Your Style. I used a few different patterned papers, some Lifestyle Crafts Flip Flops and a sentiment from Fresh Squeezed Stamps (which, sadly, is now closed). That's it for me tonight. 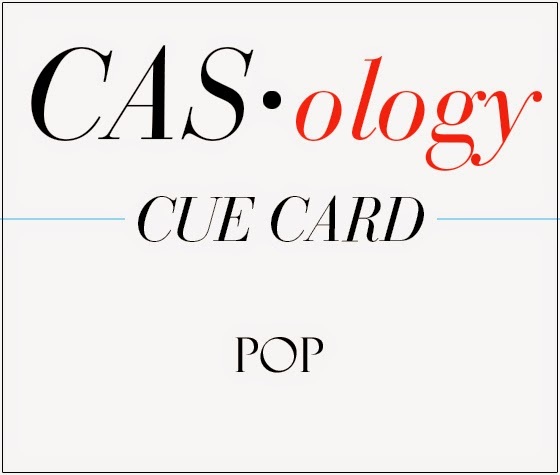 Hopefully I'll be back tomorrow with a few more cards. Have a lovely evening! 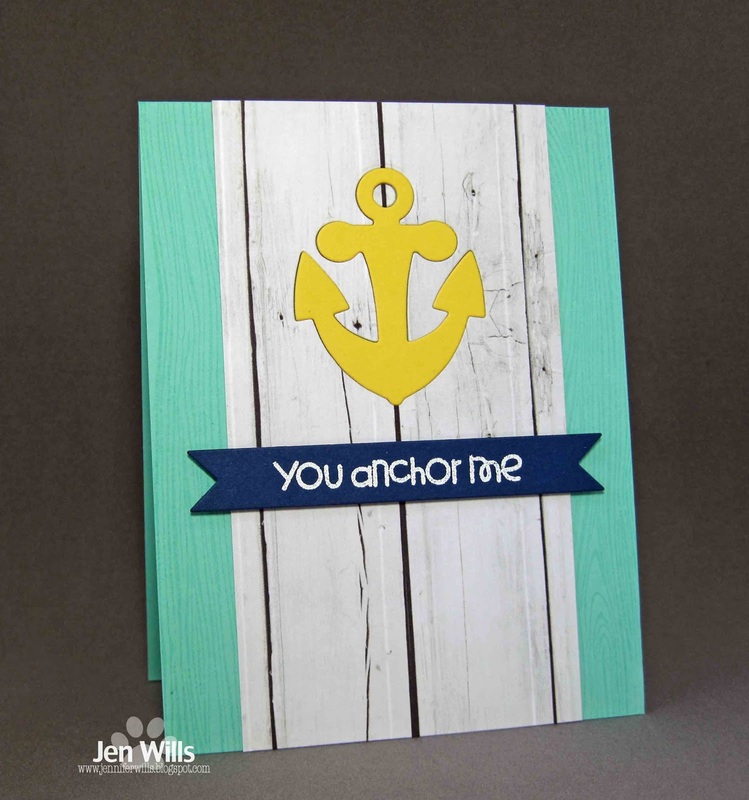 I was recently asked to make a birthday card with a lighthouse on it so this cue word came along at the perfect time for me. I inked up this Lawn Fawn image for the first time and did some simple Copic colouring. 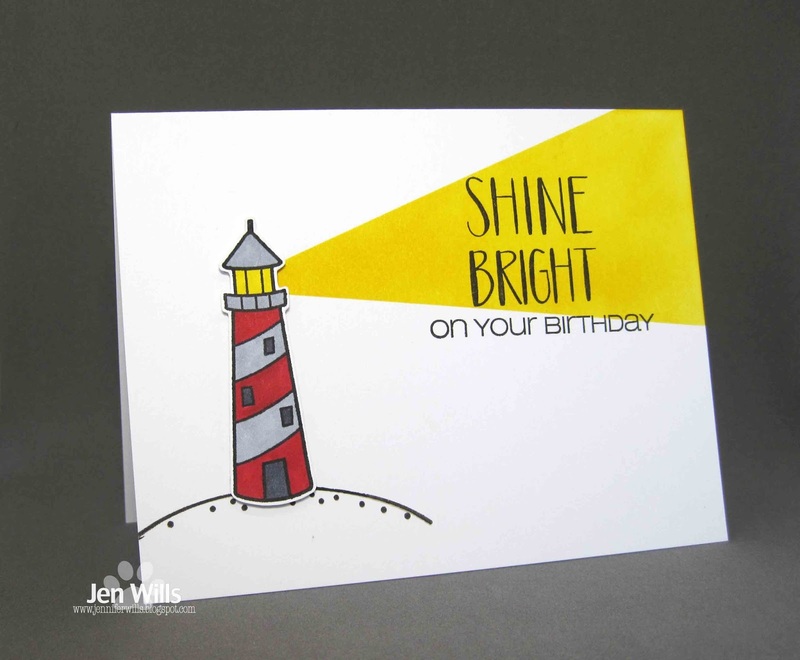 I didn't want to just slap a "Happy Birthday" onto a card with a lighthouse so I combined a couple of different sentiments to come up with this one in order to bring the lighthouse and the birthday theme together. 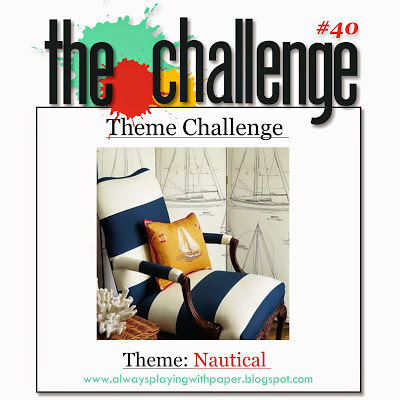 There are lots of directions you can take this nautical theme - just check out the gorgeous creations from the Design Team for some inspiration and then play along! Hi there! 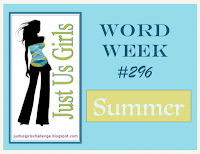 Just a quick post today. 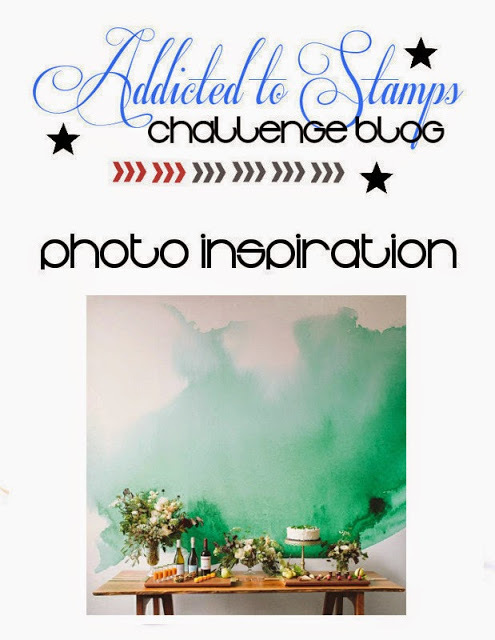 This card was inspired by the photo and colours of the Fusion challenge. Initially I planned to use just the negative of the anchor die cut but it didn't look quite right so I inlaid a yellow anchor which made it feel more complete. 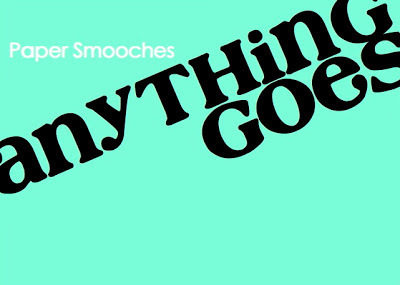 Since the dies and sentiment are from Paper Smooches I'm also going to enter this into the PS Sparks Anything Goes challenge. That's it from me. Have a lovely weekend! Hi there! I've got two cards to share today. 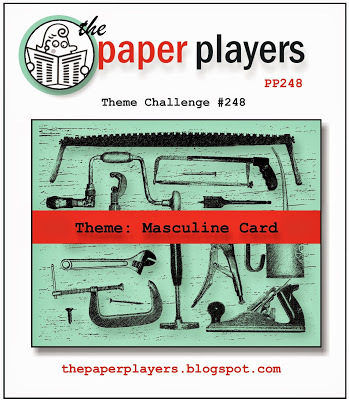 First up is a card for The Paper Players' masculine challenge. 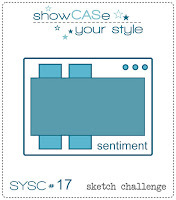 I finally broke down and ordered some Taylored Expressions stamps and dies and I love them! I actually opened them up and used them right away which I almost never do. Usually I ponder new acquisitions for ages and wonder why I thought I'd be able to actually do justice to them. 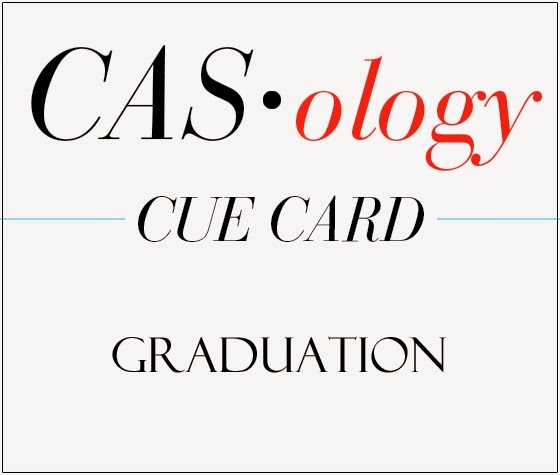 This design came together really quickly. I used Stampin' Up's brushed gold and silver cardstock for the tools and they look so cool - just the slightest bit of shimmer to them. 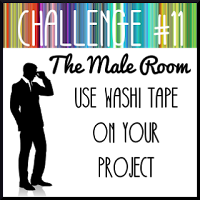 Next up is a card for two challenges. 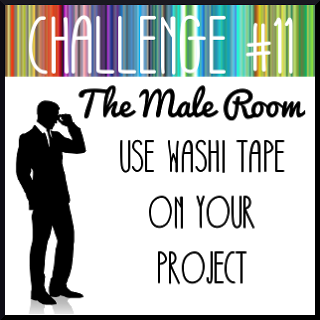 I took the colours from The Challenge and paired them with Fanciful Feathers for WPlus9's Throwback Thursday Challenge. I remember when this stamp set came out - I saw those feathers all over the place and I HAD to have them. I couldn't tell you the last time I inked them up though. 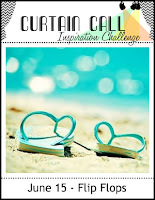 I need to take part in this kind of challenge more often! Okay, that's it for me. Back to work for now but tomorrow is Friday. Whoop whoop! 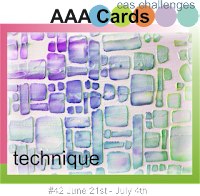 I've got 3 cards for 6 challenges to share this afternoon and most of them are pretty last minute so I'm going to get right to it! 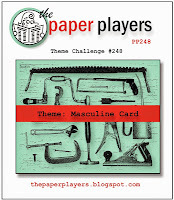 First up is an entry for the washi tape challenge at The Male Room, the Simon Says Wednesday masculine challenge and the Paper Smooches Sparks Anything Goes challenge. 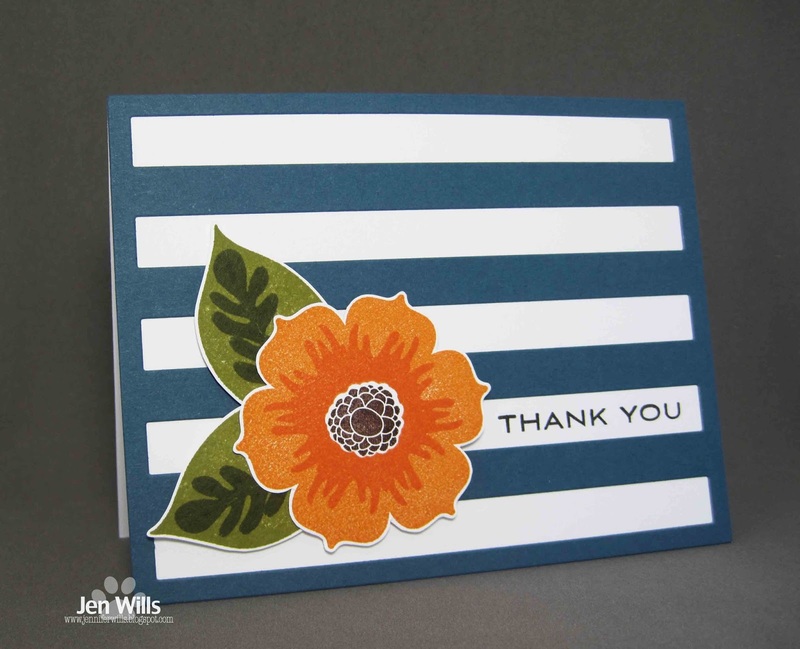 I broke out some NBUS Stampin' Up washi tape to use for the sea because the scalloped pattern on it reminded me of waves. Then I paper pieced and popped up a Paper Smooches sail boat on top of it, added a sentiment and done! A super simple CAS card! 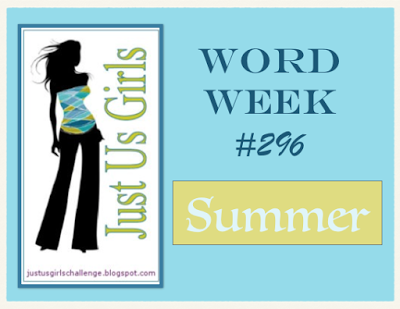 Next up is a card using the Curtain Call inspiration photo and the Just Us Girls word prompt - summer. 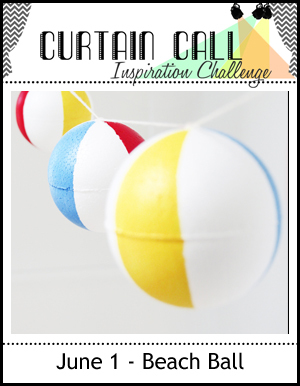 I took the colours from the beach balls and the summer theme and came up with this little love card. 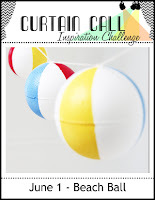 These Lawn Fawn bathing suits stamp are some of my oldest and also my favourites. They're just so cute! The background paper is hard to see but there are tiny waves on it. 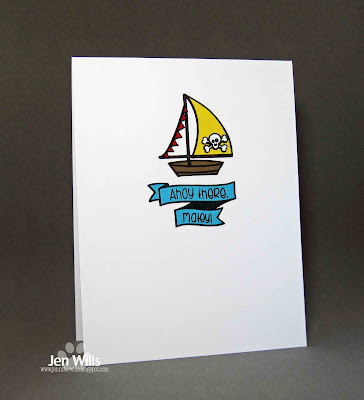 It's from studio Calico's Atlantic 6x6. 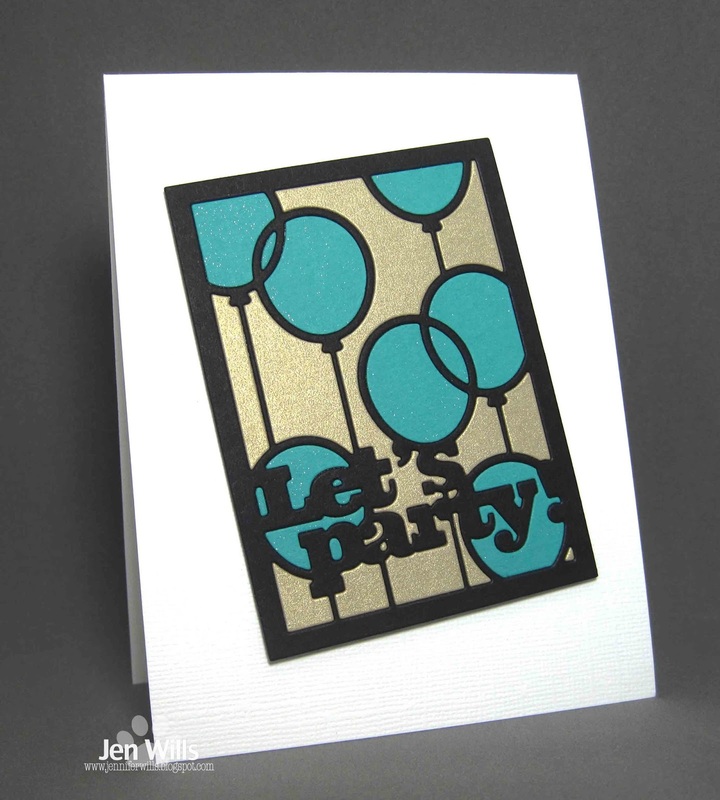 Last but not least is a card for the Just Add Ink inspiration image challenge. I immediately thought of this Papertrey Ink die and was excited to finally put it to work. 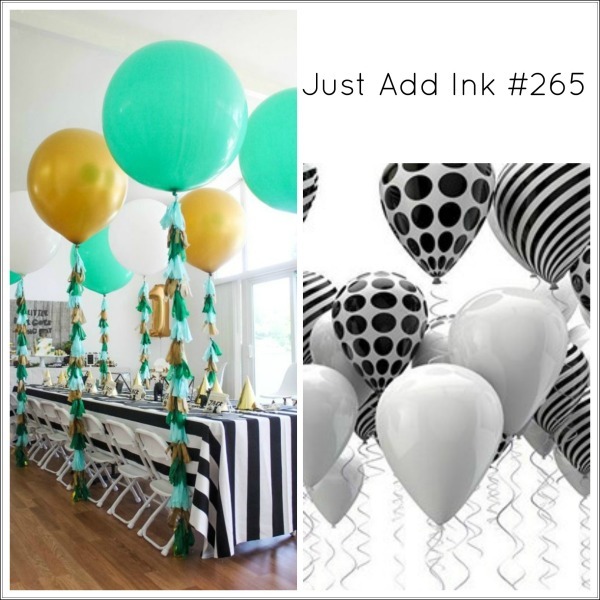 I added Wink of Stella to the balloons so they are shimmery as well as the gold background. Sparkles all around! Okay that's it for me. Time to head back to work. Hope you're all having a lovely day! I fell in love with this Papertrey Ink grad hat as soon as I saw it and it was a really worthwhile purchase as I've ended up making a ton of graduation cards this year. 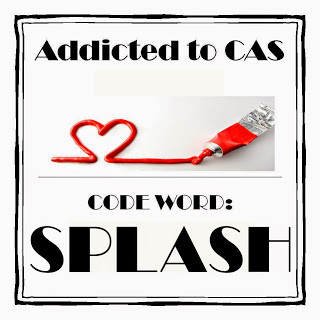 This is the most CAS of my designs. I wanted one that kind of said, "Pow! 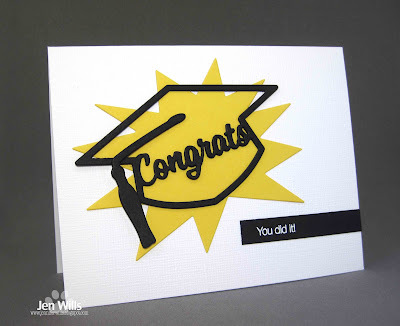 You did it!" so I reached for my trusty PS Bam Bubbles to give it that punch.